Calling all Hockey Fans – 2019 Talk Today OHL Game! ​​​​​​​This is a great evening with fun and entertainment for all ages! Come out with your family, friends and co-workers in support of Mental Health and our Community Team! Enjoy an on ice tricycle race and take part in a pre-game family and friends skate. To purchase $20 tickets to this event please email Melanie Cochrane by Monday Feb 4th! Talk Today is one of the most comprehensive mental health programs for amateur sports in Canada. ​​​​​​​Originally launched by CMHA Ontario Division in partnership with the OHL in 2014, Talk Today provides an important opportunity to address the mental health needs of athletes across the province and across Canada. This program has become a valuable platform for CMHA branches, OHL teams and individual players to encourage open discussion about mental health within the hockey community and the broader public. All OHL players receive training in safeTALK, an accredited program that teaches individuals to recognize persons with thoughts of suicide and how to take action. Coaches, team staff and parents who provide support to the players can also receive safeTALK, as well as ASIST. ASIST teaches people how to intervene when individuals are in crisis and how to connect them to the resources and help that they need. Each OHL team has a designated CMHA Mental Health Coach to provide resources and supports for the players as well as the people that surround them. Each team has a local OHL Mental Health Champion, who acts as an advocate on mental health issues within the community and helps players connect with their local CMHA Mental Health Coach. Each OHL team hosts a Talk Today community event at one home game to show its support for mental health and raise awareness about CMHA mental health programs in the community. Through a sponsorship with Teachers Life, OHL players and CMHA branches make visits to schools to speak to students about positive mental wellness. 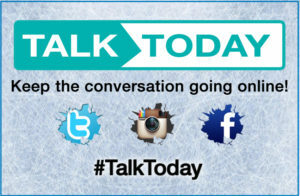 Visit www.ontariohockeyleague.com/talktoday for more information.